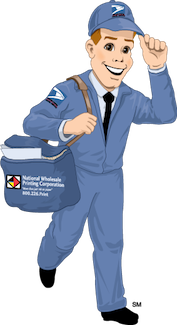 With Tech-Mail Plus by National Wholesale Printing, the old way of handling direct mail services is ancient history. Tech-Mail Plus seamlessly integrates direct-mail, Google advertising, and call tracking analytics into one cohesive marketing system. No more estimated drop dates. With the built in mail-tracking software, Tech-Mail Plus tells you exactly when your direct mail is placed into the mailbox of your target audience. This allows you to ramp up for more traffic, saving you time, money, and frustration. Marketing research has shown that it takes repeated touch-points to convert leads into sales. Tech-Mail Plus accomplishes this with the help of the Google Display Network. Your accompanying online campaign will now directly display follow-up ads to your prospects as they browse the internet, keeping leads warm until they are ready to buy. The Tech-Mail Plus call tracking feature allows you to visualize the exact data and results of your campaign as well as record and listen to sales calls. This offers valuable insight on your results as they are rolling in. Unlike traditional direct mail, Tech-Mail Plus operates on multiple fronts as a seamless, integrated system that maximizes your marketing impact. National Wholesale Printing customizes and designs your direct mail campaign to fit your specific call-to-action. It is then embedded with cutting-edge barcode technology and sent to a defined mailing list that was generated for your target audience. With our unique barcode technology your direct mail is completely traceable throughout the entire postal process. This allows you to see exactly when your mail pieces arrive in prospects’ mailboxes and plan for the influx of new customers. Once your mail pieces are received your new Tech-Mail Plus leads are funneled into an automatic follow-up system. If a prospect visits your website via the mail piece, but chooses not to take immediate action (sign-up, buy, etc. ), the Google Display Network kicks into action. Text and image ads matching your direct mail campaign now follow your prospects around the internet as they browse other websites. Constant exposure keeps you in touch and ensures that no leads get left behind. In addition to a highly customizable mailing list and integrated Google Ad capabilities you will also be assigned a unique phone number that is linked to your campaign. This allows you to track the number of calls your direct mail generates, gauge the effectiveness of different strategies, and tweak marketing messages until you discover what works the best. An additional feature allows you to record the incoming calls to review the quality of your reception and sales processes. Q: Direct mail already works for me, why do I need Tech-Mail Plus? A: If you already see success with direct mail that is all the more reason to invest in Tech-Mail Plus. The additional dimensions included in this system were specifically chosen because they enhance the return on investment from your marketing efforts. Tech-Mail Plus isn’t here to replace your direct mail campaign, it’s here to take it to the next level! Q: If direct mail hasn’t worked for me in the past, will Tech-Mail Plus make a difference? A: Absolutely! We actually discovered that “failed” direct mail campaigns aren’t actually failures, but misunderstood results. It is common practice to base a campaign’s success on the raw number of responses. Tech-Mail Plus allows you to judge your success by tracking your return on investment - are you making more than you are spending? The Google Ad, mail tracking, and call tracking features allow you to calculate this data very accurately, allowing you to discover that your campaign is more of a success than you thought! Q: How much does Tech-Mail Plus cost? A: Not much - typically just pennies per piece! After a thorough analysis of your specific needs we will customize and tailor your campaign to match, we can then provide you with an accurate quote.